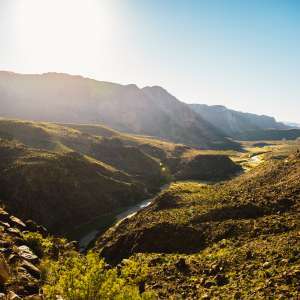 Sleep under the stars at this primitive base camp for area attractions such as Terlingua Ghost Town, Lajitas Resort and golf course, hiking in Big Bend National Park, or driving along River Road, or even Rafting the Rio Grande. We can help you customize your trip according to your interests and activity level. Explore the wilderness while you can! Check Brewster County for Burn Bans, which are frequent. It is best to bring your own grill to cook on. If burn ban is not in effect, you may make a small campfire, but you MUST bring your own firewood. Keep an eye on them! Do not let them wander away-- I have seen too many dogs lost when the sun goes down, and there are javelinas and other wildlife here. We respect their territory. Showers are avilable at the RV Park in Study Butte, along with laundry facilities, 20 miles south, near Big Bend National Park Entrance. There is a primitive campsite with a few old chairs and cots, but it's best to bring your own portable table. There are only a couple of small tables there. Bring your own bedroll and sleep under the brilliant dark starlit sky. I can almost guarantee meteor sightings! 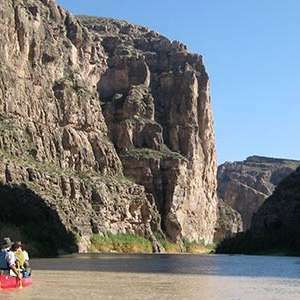 Contact Big Bend River Tours or Far Flung Adventures in Terlingua to book your unique River Guided experience for one to 10 days. These guys are outfitted well with decades of experience and will provide meals. So ride the Wild and Scenic Rio Grande! This is a very popular tourist attraction! Call Dave Long at the Barton Warnock Center in Lajitas, 12 miles weat of Terlingua Ghost Town, on the border. He has lived there longer than I can remember. Bring a fishing licence if you want to fish...I personally would not eat anything out of that muddy water, so catch and release, if anything. I'd recommed a raft trip if you want to be by the water....or the Hot Springs! Hiking is a great activity in this area! You are near Big Bend National Park, full of all levels of difficulty on different trails. Also, the newer Big Bend State Ranch has more primitive hiking. Again, call or go by the Barton Warnock Center in Lajitas, it's on the way, and worth a stop and look around in itself. Talk to Dave Long for info on local, current conditions on the River and get your permit here to go into the BBSP. Dave is a wealth if wisdom and information of the area. You must respect private property here. Get permission from the landowner before entering private property. Depending on the level of the water in the Rio Grande, you may have the option of kayaking or canoeing. Call Far Flung or Big Bend River Tours in Terlingua to get more info. 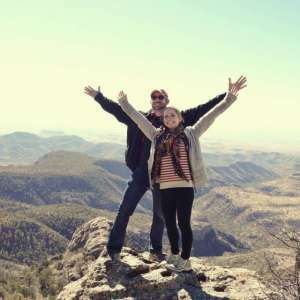 Contact Big Bend National Park for info on climbing and the condition of hiking trails. There are mountain lions and black bears within the Park, just so you know. They uaually atay hidden from humans, but there are precautions you must take. BBNP keepa track of sightings daily, so you can have a general idea where they are. All wild life ia protected in the Park. There are several hot springs along the Riio Grande, some marked and some "secret!" Not on the map, but I could tell you....maybe! This is a major migratory path for many birds, birdwatching is a great attraction in the whole Trans-Pecos area. More species of hummingbirds migrate through here, but you have to know when. Thete are certain times in the spring and fall when different species of hummers come through every year. Monarch Butterfly population variea from year to year. Birdwatching is just one of the many examples of wildlife in this wilderness area. This is still their home, although more humans have been steadily moving in, so come as soon as you can! Natural features you'll find at Tranquilo Ranch in Texas. There are small sandy beachea along the Wild and Scenic River Road, but the best in my opinion is the muddy "beach" at Santa Elena Canyon in Big Bend National Park, nearby. This is a huge Park, with lots to see, but a slow 50 mph speed limit. If you wish to swim in fresh beautiful amazing San Solomon Springs at Balmorhea State Park. It is a 100 mile north day trip, but worth every minute! Especially since fracking has begun nearby, so please go experience this Jewel before it's gone! Make reservations ahead of time if you want to camp overnight, because the pool closes early, I recommend that you get there early in the day. There are showets, primitive camping, RV camping, and cabins for rent. 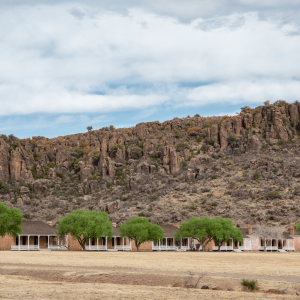 Since it is quite a distance (but a glorious drive through Musquiz Canyon from Alpine to Fort Davis, and The old Butterfield Stagecoach Route through Wild Rose Pass, you won't regret taking this way, perhaps stpping here on the way to or from our campsite, since it is on I-10. This is the most scenic and unforgettable route from the interstate to rhe Terlingua and Big Bend area. I also highly recommend Cuevo de Oso for spectacular Mexican Food inside with AC or out on the patio. Please visit Sue and Jim Franklin at the Balmorhea Rock Shop. Get some inexpensive geodes for your kids and if you are a rockhound, you've hit the jackpot here! They might even "tumble" your own rocks for you if you ask. Very friendly. Here I am promoting Balmorhea, but it is the best and only place to swim-- and snorkle, and scuba dive! Great Cottonwood trees shade the State Park. Perfect for a picnic! There are a couple of motels with friendly owners I can vouch for, as well! The Chihuahua Desert begins south of Alpine, Texas, and spreads deep into Chihuahua, Mexico. There is a legal Border Crossing in Big Bend National Park, and in Presidio, at the west side of the River Road. You must have a passport or passport card to to cross back and forth legally. However, Presidio leads to a wonderful B&B in San Carlos (Manuel Benevides), I have stayed there many times over many years, and can will give more info if you are interested. I stayed there last February, and it was quite safe. This is in the La Frontera area of Mexico, and not part of the cartels disputed territory, so I do not worry about that at all. 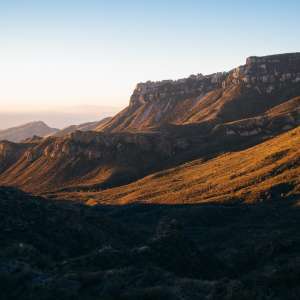 Mexico is desperate for tourists, and protect them along the route to and through the Copper Canyon. I have been through it on the train several times, and now there is a smooth two lane blacktop road..ask me for more info if you are interested. I know an experienced guide who takes several tour groups during a year. It makes the Grand Canyon look like the Bland Canyon! There are what we call "Sky Islands" in the area south of the Davis Mountains, the tail end of the Rockies. You can go up to almost 7000 ft at the McDonald Observatory north of Fort Davis. They have day tours of the giant telescopes, and "Star Parties" at dusk every Tuesday, Friday and Saturday night! We are famous for our dark skies here. The stars are brilliant! Spectacular! Thete is a great Visitor Center there, as well as coffee, hot chocolate, Mars Bars and Milky Ways... call ahead for hours of tours and visitor center and more info. This is 100 miles north of Tranquilo Ranch, but just a hop, skip and a jump for us West Texans. Rio Grande Village Hot Springs are available in Big Bend National Park, if the River Water Level isn't too high to cover them up. The water level changes frequently, so call ahead before you take the drive. Those are the most popular hot springs in the area, but I know of a better one off the map! I can tell you about if you prefer more privacy. There are also the Chinati Hot Springs -- but the road won't handle RV's. Tent camping is available-- drive 50 miles (slowly, with many places to pull over and take photos! Especially the spectacular view from "Big Hill," past Lajitas.) along the beautiful Wild and Scenic River Road, past Presidio, (There is a duty- free store (like in an international airport) there in Presidio, with liquour, perfume, chocolate and sunglasses, and cheap cigarettes, etc..!) keep driving along the River another 30 miles to one of the quietest places I've ever been. (Unless there is a wild party weekend group there, I've only seen one in 20 years, but--just call ahead first to find out! Lithium Hot Springs. You can drink it and lithium is calming, and soothing. Last time I went, I met a couple who had just driven over 500 miles across Texas, from Houston-- just to soak the man's sore back in these healing waters. I have a list available of all the percentages of minerals in these hot springs, available upon request. You can go for the day, but might not want to leave once you get there! Pets are welcome, but do Not let them wander away. There is wildlife in the area that can and will eat them! There are cabins with private hot spring pools available, so you can adjust the temperature to your liking. I love mineral hot springs, but most are just too hot for me, personally. There is a big community kitchen, and a "cool pool" has been added, which is nice during the daytime. It usually cools off pretty quick at night in the desert. From here, you can return to Terlingua, retracing the River Road, OR take Scenic, half dirt, half paved Pinto Canyon Road north to Marfa, --detour or not--another big tourist destination. Marfa has turned into an International Art Community over the past 25 years, mostly due to Donald Judd and the Chinati Foundation. I didn't get it, until I finally realized, it's not always the "artwork" that is so interesting, but the SETTING, and the epic space around the outside installations at the Chinati Foundation is what makes it so great. You can book a tour of Donald Judd's home and library, if you are so inclined. Just google it! You can even book a furnished Tipi or Yurt at El Cosmico, and check out Planet Marfa for an evening's entertainment. My favorite place to stay in Marfa is the Historic Paisano Hotel, where Elizabeth Taylor, James Dean and Rock Hudson stayed during the filming of "Giant," in 1955. There is a full restaurant and bar with a lovely big fountain on the patio for outdoor dining. There is so much to see in the whole area! I have been a tour guide, so just tell me your interests, and I can direct or plan your daytrips, or the whole itenerary just because I enjoy doing that! Let me help you customize your visit, or not. It's up to you! The Wild and Scenic Rio Grande! Hire local outfittwrs, Far Flung, or Big Bend River Tours, or just take a drive along the River Road. Go into Big Bend National Park to visit Riparian enviornment in the Chihuahuan Desert and-- soak in the hot springs, too! Stop at Balmorhea State Park on I-10 on your way to and/or from Terlingua and the Big Bend Area. Call ahead for reservations. 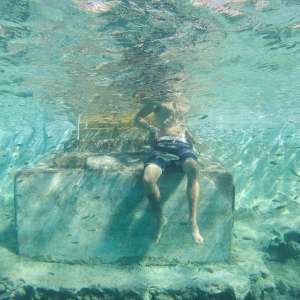 The fresh water springs have a deep and ahallow end to the pool. Snorkle gear is available for rent next door for $5 a day! The pool closes early, and in case of lightning, but there is plenty of shade from huge Cottonwood trees, and campground with RV hookups and cabins for overnight stays. I highly recommend this place before and after your stay in the desert to the south. The road from here to Alpine (get groceries at Bluewater on Hwy 118, just south of Alpine), and then only 60 miles more, the elevation drops into the Chihuahuan Desert. to Tranquilo Ranch! The stargazing at this site is incredible! I definitely recommend doing what you can to make the trip out here when a clear night is in the forecast. This campsite is also located really closely to Terlingua Ghost Town, which is a neat old mining town on the edge of Big Bend territory. This site would be a good basecamp for exploring Terlingua, Big Bend National Park and Big Bend Ranch State Park. The host is very friendly and helpful and offered to give us trip suggestions – she lived in the area for a while and it seems like she has a wealth of knowledge for recreation opportunities in the area. We had a really foggy morning when we were there, which was cool in its own way – with all the desert plants we felt like we had woken up on another planet! When there isn't any fog there are some great mountain views on the horizon. Be aware that there is no service at or nearby the campsite. The closest cell signal is further south in Terlingua. I recommend mapping out your directions before you arrive.